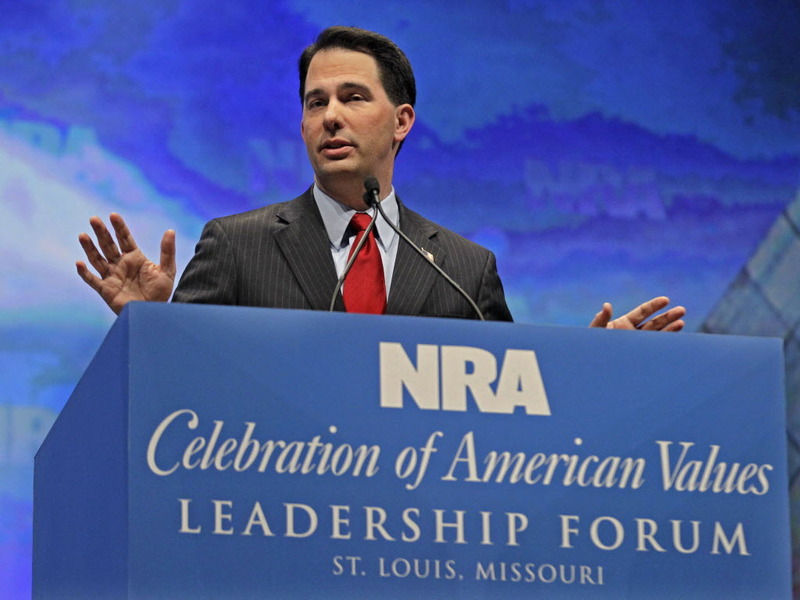 By Dave Umhoefer on Tuesday, July 2nd, 2013 at 1:07 p.m.
PolitiFact Wisconsin’s most-viewed online work in June dissected topics as diverse as the National Rifle Association’s founding, nutrition for food stamp recipients and the state of Wisconsin’s economic recovery. 1. NRA founded to fight KKK? In a video shared by the Republican Party of Milwaukee County, the president of the National Black Chamber of Commerce praised the NRA and said the group was "founded by religious leaders who wanted to protect freed slaves from the Ku Klux Klan." Pants on Fire, we found. The NRA itself says the group was formed by Union Civil War veterans to improve soldiers’ marksmanship. And we found no evidence that religious leaders founded the NRA to protect freed slaves from the KKK. While critiquing a bill mandating that food stamp recipients buy mostly healthy foods from a state-approved list, Wisconsin Democratic Party chairman Mike Tate said practical realities were ignored. "A bag of Cheetos costs less to buy than an apple," he said. "You go around some neighborhoods in Milwaukee and, good luck trying to find an apple or a banana or some sort of healthy option." Mostly True, we found after visiting stores in low-income city neighborhoods. Tate was mostly right on the price comparison, and was partially accurate in suggesting it’s very difficult to locate fresh fruit. We noted: "While fresh fruit can be found at big and some small stores, it’s more available in some low-income areas more than others, and getting there, finding it worth eating and paying for it are a challenge for some, according to experts and residents." Countering liberal criticism that presidential ambitions have distracted him, Gov. Scott Walker claimed success on various fronts. One on his list: "Our ranking in terms of the best and worst states to do business in was 43 four years ago and we just moved up to 17 two weeks ago." We rated his claim Half True, noting the state’s ranking depends on which study you read. Walker cherry-picks the most favorable studies, but ignores studies showing much lower rankings and little or no improvement. Walker's secretary of health services, Kitty Rhoades, said the state is "not walking away from a dime" due to the governor’s rejection of funding for a Medicaid health care expansion under the new federal health care law. We found only an element of truth in her claim, in that under Walker's alternative plan, some level of federal funds will flow to Wisconsin insurers and health care providers based on the number of people who choose to buy health insurance through Obamacare exchanges. But Rhoades was responding to critics worried about the impact on state government of turning away $119 million just in the next two years. Rhoades doesn't dispute that figure. Our conclusion: her claim was Mostly False. The governor said the success of his economic agenda is supported by the fact that "we went from unemployment at 9.2 percent when I decided to run for governor four years ago to two points lower." The claim has an element of truth but is misleading, we found in rating it Mostly False. Two-thirds of the drop came under his Democratic predecessor, Gov. Jim Doyle. But before we move on, a look-back to May’s top-clicked item. It was our "In Context" article fleshing out an exchange between then-Secretary of State Hillary Clinton and U.S. Sen. Ron Johnson, R-Wis., during a Senate Foreign Relations Committee hearing about the Sept. 11, 2012 bombing of the U.S. consulate in Benghazi, Libya. As always, you can email us at [email protected], find us on Facebook atfacebook.com/politifact.wisconsin, and on Twitter at @PolitiFactWisc.